As anyone who suffers from motion sickness knows, this condition can be really debilitating, affecting the things you can and cannot do. 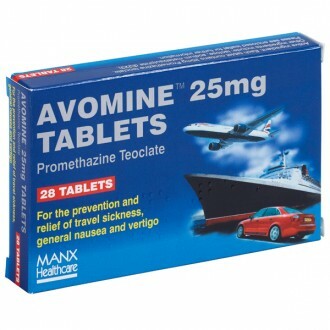 In order to help combat motion sickness you can benefit from specialist products, which includes Avomine Tablets 25mg. This treatment can also be used for symptoms of vomiting and nausea. Avomine Tablets are a convenient and easy to use solution for people who suffer from motion sickness. It is a useful medicine to have on hand as it can also be used to treat vomiting and nausea caused by other illnesses. 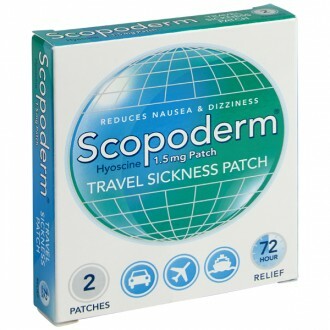 Travel sickness can be a very debilitating condition, often restricting everyday activities. Specialised products such as Avomine Tablets can be used as an effective method to combat the symptoms of travel sickness. Avomine Tablets can also be used in the treatment of vomiting and nausea including travellers diarrhoea treatment. Promethazine theoclate, is the main ingredient in Avomine and it stops naturally occurring histamine from binding to its receptors in the vomiting centre of the brain. Normally, this part of the brain reacts to nerve signals from the vestibular apparatus in the middle ear. The vestibular apparatus tells the brain about movements of the head. Constant movement such as when travelling by car or boat can cause too many signals to the vomiting centre, resulting in symptoms of nausea, vertigo, or vomiting. Promethazine theoclate blocks the action of histamine in the vomiting centre thus preventing the nauseas feelings. To prevent travel sickness on longer journeys, take 1 tablet each night before bed, starting with the night before travel. To prevent travel sickness on shorter journeys, take 1 tablet 1 or 2 hours before commencing travel. 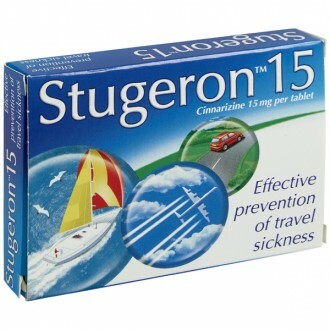 To treat travel sickness, take 1 tablet as soon as symptoms appear, and follow up with a second tablet in the evening. If necessary, take a third tablet on the following evening. Use only half a tablet, at the same time as adults. Avomine Tablets should not be used by children under 5 years old. To treat vomiting, sickness or vertigo that is not caused by travel sickness, take one tablet (or half of one tablet if between 5-10 years old) three times a day. Confusion, dizziness, restlessness, headache, tiredness, children may become excitable, blurred vision (especially in elderly people), dry mouth, loss of appetite, difficulty passing water, nightmares, muscle cramps, stomach upsets, rigid movement of head and facial muscles, jerking and twitching in muscles. If any of these effects concern you, or this medicine has any other effect on you, stop using it and consult with a doctor or pharmacist. The active ingredient contained within Avomine tablets is Promethazine theoclate 25mg. Lactose, sodium metabisulphite (E223), potato starch, dextrin microcrystalline cellulose, stearic acid and magnesium stearate. Make sure to read the following instructions carefully before using this product. Do not give Avomine tablets to a child under 2 years old. Do not use this product for more than 7 days in a row. Tell your doctor or pharmacist of any other medicines you take or are intending to take before using this product. Do not use Avomine tablets alongside alcohol as the effects of alcohol will be magnified. You should not use Avomine if breastfeeding, pregnant, or if you suspect you are pregnant, unless a doctor tells you otherwise. Avomine may interfere with the results of pregnancy tests. Avomine can cause babies to become irritable if used whilst breastfeeding. Avomine tablets can make you drowsy, disorientated and confused. Until a few days have passed and you are certain that Avomine does not affect you in these ways, you should refrain from driving or operating machinery. Avomine tablets contain lactose, so if you have an intolerance to certain sugars, you should consult with a doctor before using this product. Avomine tablets contain sodium metabisulphate, which have been known to cause difficulty breathing (bronchospasm) and allergic reactions. Make sure to read the entire product information leaflet and all packaging before using any new medicine. Inform your doctor of any medicines you intend to take. Need to know more about Travel Sickness? Avomine tablets are used to prevent or relieve nausea and vomiting brought about by motion sickness or various other causes. It can also treat vertigo, a symptom of an inflamed middle ear or Ménière’s disease. The active ingredient is an antihistamine called promethazine teoclate. Motion sickness and vertigo occur when the brain receives certain nerve signals from the vestibular apparatus. This is the name for a series of organs in the middle ear which compose the body’s sense of balance. Some types of movement can cause this balance to be disrupted. When this happens, nerve signals are sent to the brain which cause involuntary feelings of nausea, dizziness or spinning. The active ingredient in Avomine is an antihistamine called promethazine teoclate, which prevents these signals from reaching their receptors in the vomiting centre of the brain. If you are using Avomine to treat motion sickness, take a tablet as soon as you begin noticing symptoms. Have another tablet later that evening. If your symptoms persist, you can have a third dose the following night. If you are using Avomine to prevent motion sickness, take one tablet one to two hours before your journey. If you will be travelling for a long time, take a tablet the evening before you set off, and continue taking one dose per evening. If you are using Avomine to treat vertigo or other types of nausea, take a maximum of three doses per day, or as prescribed by your doctor. Avomine can be taken with or without food. It should not be used by children under the age of 5. Children of age 5 to 10 should take a half tablet per dose, rather than a full one. Avomine should not be taken for more than seven consecutive days unless specifically prescribed by your GP. Is it safe to drive while using Avomine? Potential side effects of Avomine include drowsiness, dizziness or disorientation. You should not drive or operate machinery until you know that you are not affected by these side effects. Children using Avomine can also exhibit these side effects, and so should be supervised. They should not take part in potentially dangerous activities until they are shown to be fully alert. Can I drink alcohol while using Avomine? It is advised not to drink alcohol while using Avomine. This is because it may intensify potentially harmful side effects such as drowsiness or dizziness. What are the other side effects of Avomine? This medicine may increase the skin’s sensitivity to sunlight. It is advised to avoid direct exposure to sunlight or UV lights when you first start using this treatment. Ensure that you are fully protected by clothing or sunblock if you do go out in the sun. Avomine has been known to interfere with the results of skin prick tests (for allergies) and pregnancy tests. Is Avomine suitable for me? This medicine is unsuitable for anyone with an allergy or intolerance to any of its ingredients. It should not be given to children with any symptoms of Reye’s syndrome, a condition affecting the liver and brain. Is it safe to take Avomine with other medicines? Avomine is unsuitable for any patients who have taken a monoamine oxidase inhibitor (MAOI) antidepressant within the preceding fortnight. You may be advised not to take Avomine if you are taking any other medicines which cause drowsiness or reduced awareness. When you fill in your medical questionnaire, it is important that you disclose any other medicines which you are taking or intend to take.